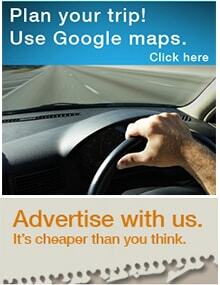 An adventure journeying from one side of Australia to the other. The challenge was to conquer over 4,500km in two weeks, from Coonabarabran in north west New South Wales to Broome in north west Western Australia, with a two and almost four year old. Along the way we planned to fly over Lake Eyre which we had missed out onin 2010 and then spend the dry season in the Kimberley before making our way down the Western Australia coast. 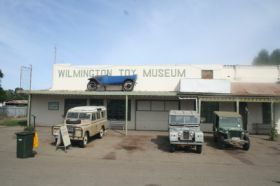 As is usually the case with our adventures we were not quite as ready as planned to leave on Anzac morning however by lunchtime we felt organised enough to take off and whatever had not been packed we figured we would get by without.We left mid afternoon and made our way west. The majority of our trips start or finish with a crossing of the Warrumbungle National Park mountain ranges and this time was no different. The hills leading down into the park were just as steep as some of those we had encountered in Tasmania and the Oka and Bushtracker tackled them with ease albeit at a slow pace. As we left the mountains of the National Park we entered the flat farming country of the Gulargambone and Warren region. This part of the world had certainly responded to the rains of 2010 and early 2011 and there was an abundance of feed. The kids seemed happy enough to be on the road travelling again singing along to their music. I was wise enough not to count on them staying this way though it was very early on in our journey and there were a lot of kilometres in front of us. It was nearing early evening and so we stopped at Sandy Creek Rest Area, a free camp 8km south west of Warren or 12km north of Nevertire. It was a pretty area with green grass for the kids to play and chase a neighbouring campers little dog around and the creek made a nice backdrop for our camp. We enjoyed our first night back on the road and as is inclined to happen whilst travelling our bodies were becoming attune with the natural rhythms of day and night not living by the clock and we were all tucked up in bed not long after the sun had set. A good nights’ rest and a hearty breakfast and we continued on our journey heading further west through Nyngan to Cobar where we stopped at the Great Cobar Heritage Centre built in 1910. We stocked up on supplies at Cobar and from here on end the landscape remained fairly similar with lots of new growth from the rain and creeks and small waterways recently cleaned out by flood waters. Fences showed signs of where the flood waters had come through and there was some damage on the roads still. Apart from the mobs of goats and emus there was no other wildlife to be seen and we assumed they were off taking advantage of the good season and plentiful water. 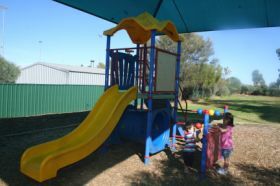 We drove through Wilcannia but decided we would not make it to Broken Hill that night so we camped at Springs Creek Rest Area which was 74km west of Wilcannia, a perfect camp spot for the kids as it was set back off the highway and had a playground to burn off some energy. This rest area and MacCullochs Range Rest Area 55km east of Wilcannia were the pick for families camping overnight with playgrounds and toilet facilities at both. We spoke to some like minded travellers who were also heading west and as always were amazed at the diversity of people exploring this great country of ours. A late start the next morning saw us arrive in Broken Hill, also known as the accessible Outback, just before lunch, we visited the Visitor Information Centre and picked up our detailed brochure on the Sculpture Symposium and the Living Desert. 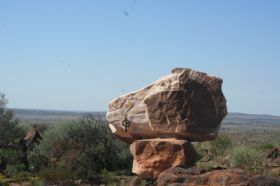 This attraction is 9km from Broken Hill nestled amongst the Barrier Ranges and offers a walking trail where visitors can explore the flora and fauna of the surrounding arid landscape. There is a shaded picnic area with barbeques and toilet facilities and a fantastic lookout that gives a panoramic view of the region located close to the sculptures. The sculptures themselves are twelve Aboriginal story-line poles and offer a contemporary interpretation that reflects past culture, the kids loved exploring amongst them. It was a great place to stop for lunch and after an extended stay in Broken Hill we made our way across the South Australia border. Fruit could not be taken across the border so we had already eaten what we could at lunchtime and cooked our vegetables knowing that about 200km after crossing the border they would have to go too. The country from Broken Hill to Yuntais mainly flat gibber plains with the odd ranges. We had been that way four years before and this time like most places that we were revisiting the landscape was remarkably different after recent rain events with lots of ground cover and grasses instead of the rocky gibber landscape. After Yunta the landscape changes with the gibber plains giving way to undulating hills and farming country that emulates the lower Flinders Ranges. We had explored the Flinders Ranges previously and had decided that this trip we would take a different track to Lake Eyre. We were not going to make it to Port Augusta and with a decision not to undertake any night driving we arrived late afternoon to Peterborough Rest Area, a large camp spot off the main highway with plenty of shade, 2km from Peterborough. It was here that we were reminded how small the world was with fellow campers turning out to be friends and former work colleagues of people we knew from home. The next day we pushed on to Port Augusta, the last main centre before hitting Alice Springs so we decided to stock up and enjoyed a long lunch on the Port Augusta waterfront. Port Augusta is a pretty town and we enjoyed the waterviews as we ate. It was late afternoon by the time we left Port Augusta and we knew that we were not going to cover much distance that day. The next leg of the journey took in the full length of the Stuart Highway to Katherine. Whilst we had covered most of this highway in previous trips we had never tackled the southern part which was fairly similar to the northern section with considerable open gibber plains and dunes with masses of groundcover from the unusually large amounts of rain of late. The normally dry lakes were also full but despite the water the landscape reminded us of how vast and arid Australia really is. We had planned to stop overnight at Island Lagoon Lookout 17km south east of Pimbabut when we pulled up the flies drove us away, so we decided to make an overnight stop at Spuds Roadhouse at Pimba where we found free camping and a gold coin donation for the Royal Flying Doctor service for use of the toilets and showers. The kids played a few games and we had a meal in the roadhouse that night before setting off the next morning to Lake Eyre via Roxby Downs. We set out reasonably early and passed Woomera the famous military site before calling in to Roxby Downs. It is a town funded by BHP for the Olympic Dam mine workers and their families. 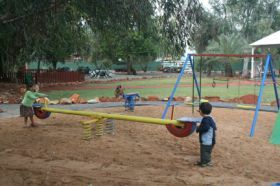 A pretty spot with all the facilities a travelling family looks for including lush green playgrounds and spotless BBQ facilities. After a short break we pushed on to our destination Lake Eyre. We arrived at Lake Eyre South at lunchtime and had a bite to eat by the lake. It was an amazing site to see water in the lake especially considering we had seen it bone dry and salt encrusted in our previous travels. Although the day was windy it was nowhere near the winds of the dust storm we had encountered four years before. The views were spectacular and we knew we were witnessing something special. We took the kids down to the Lake where they played in the mud and the salt and the water. 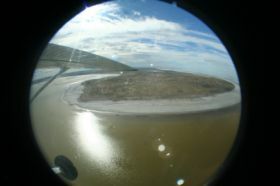 We could hear birds calling out on an island that we could barely see with our naked eye and were looking forward to our flight over Lake Eyre North the next day. After our play in the Lake we headed along the Oodnadatta Track that for the most part follows the old Ghan rail route. Our next overnight stop was Coward Springs where we took the kids for a swim in the springs and wandered around the historic ruins. The camp spot offers a little oasis in the desolate surrounding landscape with date palms, plenty of shade, springs to cool off in and clean toilets and showers. We had an early night partly to avoid the mosquitoes and partly to get a good sleep before heading off early the next morning to William Creek to arrange our flight over Lake Eyre North. On our way to William Creek we called into the various railway sidings and ruins on the way, Beresford, Strangways and Irrapatana to find they were just as preserved as they were four years prior and remarkably old rail sleepers could still be found on the tracks. WarrinerCreek was still flowing and Lake William had water in it and the surrounding countryside was a very different one to what we had previously found with lots of green grasses, low lying shrubs and creeks and small lakes carved by the recent flowing waters. The Halligan Bay Track was open but we decided not to take the detour in as we would be flying over it this time. 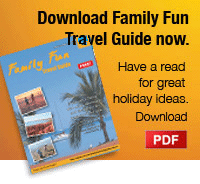 We booked our flight with Wrightsairover Lake Eyre at William Creek. 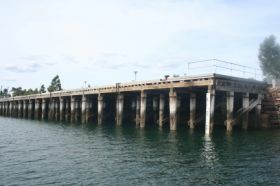 This town hasone of the smallest populations in Australia and is situated on the world’s largest working cattle stations, Anna Creek, part of the S. Kidman and Co. empire. We spent the next few hours avoiding the flies. The kids were excited about their first ride in an aeroplane and I kept them busy whilst we had lunch and Greg did some minor repairs to the OKA. 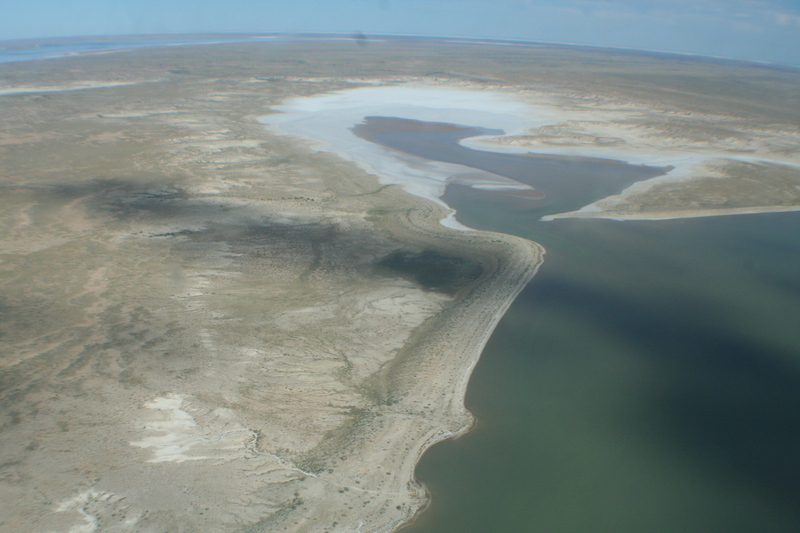 We were excited about fulfilling a dream to fly over Lake Eyre whilst it had water in it, and it turned out that 2011 was a better year to fly over as they were expecting more water this year than the last. The only true way to appreciate the vastness of Australia’s largest inland lake and the world’s largest salt lake, Lake Eyre, is to fly over it and to do so when it is full of water was a truly remarkable experience. The colours and patterns of Lake Eyre North were accentuated from the air and it captivated us from start to finish. The prehistoric river systems entering the lake and the patterns they formed were beautiful. It was hard at times to see where the lake finished and the sky began but we were lucky enough to have some cloud in the sky giving the landscape definition. It was incredible to see the surrounding desert normally dry and arid brought to life with channels of water, lush green grasses and colourful wildflowers. The flight allowed us to see the lake from another perspective and the kids enjoyed every second of it. We flew over ABC and Halligan Bays, past Hambidge Point, Babbage Peninsula and Bonython Headland and then over Belt Bay, the lowest point in Australia, averaging between 12 to 17 metres below sea level. Whilst taking in the amazing sight of present day Lake Eyre I could not help wondering what it would have been like 35,000 years ago looking at Lake Dieri (or the ancestral Lake Eyre). 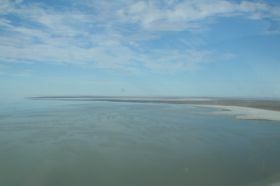 It was three times the size of the present Lake Eyre and had a depth of at least 17 m. At that time, lush vegetation surrounded the lake and 20,000 years on the climate had changed so much that the rivers that fed the lakes diminished and then stopped flowing, apart from the occasional flood which we were witnessing, a truly remarkable lifetime experience! On our journey back overland to William Creek our little boy decided it was all too much and fell asleep whilst our daughter started to get the beginnings of motion sickness, the one hour flight was a good choice for our family. After our flight the kids were ready for a sleep and with grey storm clouds looming in the distance we made the decision to head off, as we knew it did not take much rain to make the roads slippery, boggy and impassable. We had never been to Coober Pedy as last time we were here we had travelled through to Oodnadatta and the Painted Desert. This time we took the William Creek Road which had detours in place in some sections where the road was still impassable due to water. The cattle from Anna Creek Station grazed on the lush grasses beside the road and the nearby thunderstorm brought out the many colours of the landscape. At Coober Pedy half the population live in underground dugouts to escape the high temperatures in summer and so we decided to join them and stay at the only underground camping and caravan park, Ribas. Whilst we did not take the Bushtracker and OKA underground we did take the kids to explore the underground camping area and common room. It was mind-blowing to see the amount of work that had been undertaken to allow people to live under the earth in comfort. Rain overnight had made the road we had just traversed impassable so we had made the right choice to travel through the day before. We explored Coober Pedy, home to around 4000 people from over 40 countries and where most of the world’s opals are produced. The man-made and natural landscapes, in and surrounding Coober Pedy, have attracted film makers from around the world and it was fascinating driving around the area. Leaving Coober Pedy we knew there was far more to explore however we had our ultimate destination in sight so we vowed to return some day. We headed back to the Stuart Highway, also known as the Explorer’s Way, named after John McDouall Stuart and stretchingsome 3,200kms from Port Augusta to Darwin. The landscape around the section of highway between Coober Pedy and the Northern Territory border was more of the same, gibber plains, shrubs and grasses that had sprouted with the recent rains. We stopped for lunch at the Cadney Park roadhouse where four years prior we had arrived with relief after tackling a very wet, boggy road from the Oodnadatta Track through the Akaringa Hills and Painted Desert. This time we were travelling the Highway and so did not arrive with the same sense of relief but the refreshments were just as enjoyable. Our next rest stop was Marla, the first and last settlement along the Stuart Highway in South Australia and a welcome green shady spot for travellers. We arrived at the Northern Territory and South Australian border just before dark and took the obligatory photos on either side of the sign and then pushed on to our camp for the night. Rain overnight and some slight showers early in the morning gave us nice cool weather to travel in that day and we travelled through Kulgera, once thought to be the centre of Australia, onto Erldunda, junction of the Stuart and Lasseter Highway where we fuelled up. On our trip back from Uluru last time we fuelled up at Erldunda and the prices were quite high however, this time they were not too bad in comparison to some of the smaller places we had stopped. We pushed on past Stuarts Well, close to the beautiful Rainbow Valley and 4WD track to Chambers Pillar and home to Jim Cotterill, whose family cut the first road to Kings Canyon, Watarrka National Park and his famous singing dingo Dinky. 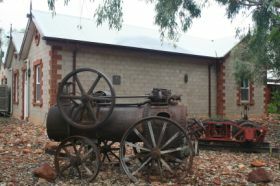 We made our morning tea stop, the Road Transport Hall of Fame and Old Ghan Train Railway Museum, at Alice Springs. 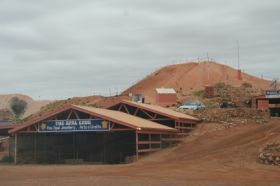 This was our base for 5 weeks over four years ago when we explored the Red Centre. It was great to catch up with Liz, who along with Kel dedicate much of their time to the preservation of Australia’s unique road transport heritage. They offer camping in return for volunteer labour which is vital for them to run and develop these two attractions. Since our initial visit alot of work had been done and it was a great place to enjoy a coffee whilst the kids played. 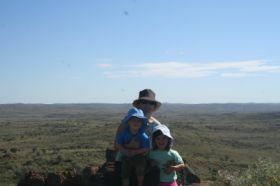 We planned to make it a stop on our Iconic Outback Tracks OKA trip planned for 2012. Alice Springs was one of the last major towns before Katherine so we stopped in town to stock up on supplies and fuelup. We had explored this part of Central Australia on our previous travels and looked forward to returning in 2012 to revisit some of our favourite places like the West and East MacDonnell Ranges, Uluru (Ayers Rock), Kata Tjuta (The Olgas) and Yulura (Kings Canyon) in the Watarrka National Park. The rest of the day we travelled along the highwaypassing places that all had their own unique stories and wartime history. 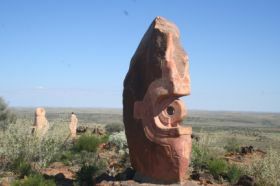 Aileron, with its large statue of an Aboriginal man holding a spear and Ti Tree built on an aquafier that was used as well dug for those working on the overland telegraph line. Next Barrow Creek, a service centre made famous by being close to where Peter Falconio disappeared and then Wycliffe Well, one of 13 army farms during the war that supplied food for more than 55,000 people who were defending the north. Lastly before our overnight stop at the nearby Devils Marbles we passed Wauchope where we could glimpse the Davenport Ranges in the distance. 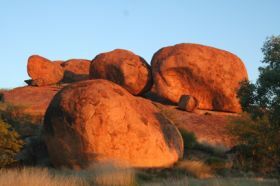 An hour or so before dusk we reached the Devils Marbles (Karlu Karlu) and it reminded me of peak hour in Sydney’s CBD with caravans, camping trailers, motorhomes and tents of all shapes and sizes lining the camp area. 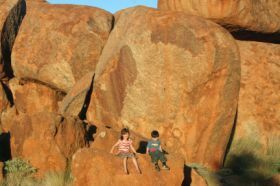 We used what was left of the daylight to explore the gigantic, red-coloured granite boulders and were fascinated with their size and shape, some up to 7 metres. The fading light allowed for some magic photos amongst the spectacularly poised marbles. An early start meant we had the best of the morning light too and it wasn’t long before we reached Tennant Creek. A stop at the Tennant Creek Visitor Centre and Battery Hill complex allowed us time to enjoy the nature walk, historic buildings and machinery. Gold and copper has been mined in the area for over 50 years and still remains important to this real outback town today. Just north of Tennant Creek is Lake Mary Ann, a man-made dam where locals swim and canoe, surrounded by landscaped grassy areas and natural bushland. We enjoyed our lunch here whilst the kids took advantage of the playground. The flora and fauna along the next section of the Stuart Highway had flourished since we had travelled it in 2006. The high vantage point in the OKA meant that we could see over the top of the growth and see the waterways and springs still flowing from a good wet season. We passed by Three Ways, the junction of the Stuart and Barkly Highways and through an important waterhole for the Aboriginal people, where during the building of the Overland telegraph line, Doctor Renner noticed a large gathering of birdlife and discovered RennerSprings. Approximately halfway between Darwin and Alice Springs , we stopped at Elliot, which gradually grew after the war at the expense of nearby Newcastle Waters, the historic droving town. The momentous occasion of joining the ends of the Overland Telegraph Line occurred just south of Dunmarra and it was not far past this small place that we took a detour off the Highway to visit Daly Waters. It was here during the epic crossing of Australia by John McDouall Stuart’s Expedition, a tree was blazed with Stuart’s initialsand it can still be seen today. We decided to take advantage of the relatively cheap camping and cool refreshments at the Daly Waters Pub and spent a nice afternoon relaxing and made the decision to slow the pace down on our next leg. After a late breakfast we headed back to the Highway and passed through Larrimah meaning “resting place” and onto Mataranka. This was a region that John McDouall Stuart described as ‘simply magnificent’ and we had to agree. The Mataranka Thermal Pool, part of the Elsey National Park is a constant 34 degrees and the crystal clear water flows at a 22.5 million litres per day and a swim here is an experience not to be missed! Enjoying a slower pace we decided to camp at the resort overnight and spend more time enjoying the thermal pool. 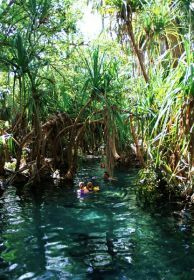 There is a lot to be said for the beauty of these pools and whilst there are other natural pools close by the Mataranka Thermal Pool was perfect for our small children. In the morning we had a look at the Elsey Homestead at Mataranka Resort, a replica from the film “We of the Never Never” by Jeannie Gunn about the story of her life on Elsey Station. We then made the journey to Katherinewhere we found that this third largest regional centre of the Northern Territory had grown. 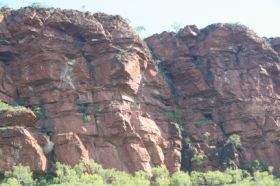 It was still a popular tourist destination with Nitmiluk (Katherine Gorge) National Park nearby and this was backed by the beef, mining and horticulture industries, meaning Katherine was thriving. We stocked up again and topped up our fuel before heading west along the Victoria Highway edging ever closer to the Western Australia border. 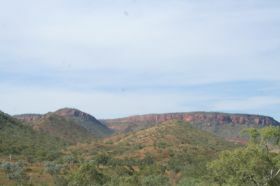 The remnants of the wet and the flood waters lined the edges of the road and the scenery had changed to grassy plains, boab trees, majestic gorges and sandstone escarpments. This was an area we had never been to before and we enjoyed the scenery along the highway as it wound past immense escarpments split by the awe inspiring Victoria River. 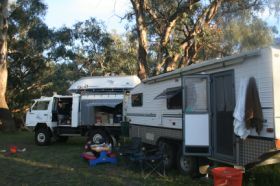 A roadhouse and campground at Victoria River Crossing beckoned but we had plenty of daylight left so kept travelling. We made our way on through Timber Creek, home to around 70 people to our camp for the night in Jutpurra (Gregory) National Park alongside the Victoria River. Fishing for barramundi brought visitors to this area and whilst we were not fishing this time we enjoyed the peace of our camp fire, the prolific wildlife and the ancient boab trees. An early start the next day enabled us to enjoy the morning light as we drove through more spectacular escarpment landscape and we could not wait until we returned to explore the extensive network of four-wheel drive tracks in this National Park. Further west, we reached Keep River National Park, known as a photographer’s dream but as we were on a mission to reach the border and Kununurra that day it would have to wait for a return visit. It was late afternoon when we reached Kununurra, plenty of time to catch up with friends who were working there and after a BBQ and a late night we were in no hurry to head off the following day. We did eventually say our goodbyes and made plans to catch up when we returned later in the season to explore what the East Kimberley had to offer. Broome beckoned so we made tracks, howeverthe late night soon caught up with us and we stopped along the Great Northern Highway to catch up on some sleep. The rest of the afternoon we spent driving through beautiful scenic landscapegiving us a taste of what to expect of the Kimberley region. We bypassed the Purnululu (Bungle Bungles) National Park and headed through Halls Creek to Caroline Pool where we found a small oasis beside a waterhole to camp the night. The next day we pushed on with our destination Broome in our sights. We had lunch at Fitzroy Crossing and made plans to see Geikie Gorge, Tunnel Creek and Windjana Gorge when we explored the rest of the Kimberley. An uneventful few hours broken up by a helicopter mustering cattle across the road and scenery that reflected the end of the wet season with lush green growth dotted with red termite mounds and boab trees led us to our final destination. 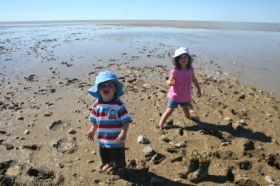 We had met our challenge, flew over Lake Eyre, covered the distance from Coonabarabran to Broome in two weeks with the two kids under 4 and arrived to a picture perfect tropical paradise. Endless white beaches, fringed by the turquoise waters of the Indian Ocean, strikingly contrasted against the red sands and cliffs, and our home for the next few months. 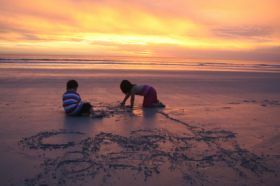 We looked forward to our next adventure exploring the Kimberley before making our way down the Western Australia coast.